Jerry and I were married, in Winona Lake, Indiana on June 13, 1959, fifty-six years ago! We met on July 3, 1958. 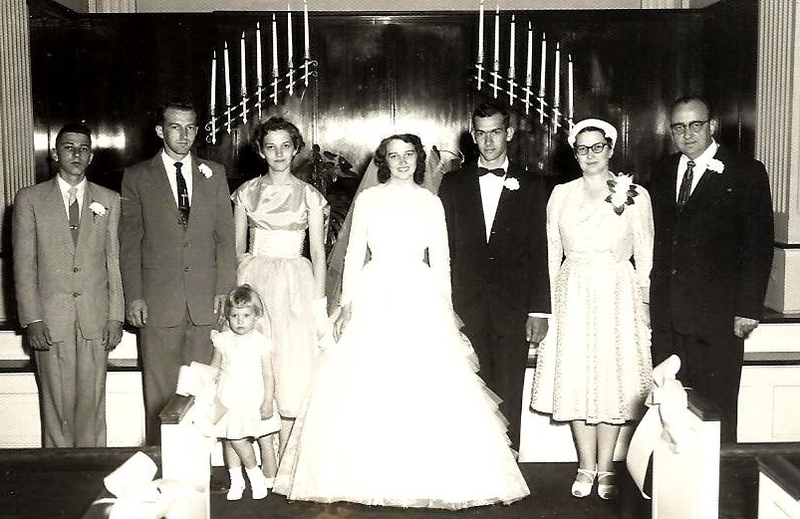 This picture is of my family, my two brothers, Bill and Richard, were ushers, my sister, Lorraine Meadows, was my matron of honor, my little niece, Christine Meadows, was my flower girl. Of course Jerry and I are in the middle. Mother and Dad are on the right. I’d been attending school in Wessington Springs, South Dakota and had completed my freshman year. I was writing back and forth with a fine young man, Burt. We enjoyed each other’s company, but there wasn’t anything serious between us…yet. Jerry and I met at a Free Methodist Church camp, near Gladwin, Michigan and my dad, Glen Williamson, was the camp evangelist. I was with my parents and younger brother, Bill, only because a summer job I’d been promised hadn’t started yet. Instead of sitting at home with nothing special to do Mother suggested I go with them to Michigan. So I packed my suitcase and went along. Just outside the tabernacle, where the services were held and where my dad was preaching, was a big oak tree. On July 3, when my new friend, Mary Morse, and I left the tabernacle, after the service, we saw two very good looking, sharply dressed guys standing under that big oak tree! Mary introduced us. One was her brother, Bob. The other one was Jerry Archer. The next day, July 4, Jerry came back to camp. There were boat races on the river at the next town, Beaverton. Would I like to go and watch them? Several others our age were going. Sure, of course, I’d love to go. Jerry had a sharp, black and white, ’54 Olds 98, with a red interior! He held the front door for me to get in! Bob and another girl got in the back. That evening, after talking my parents into excusing me from the evening service, we went to some car races at West Branch, Michigan. This was our first actual date. It seems strange, but I don’t remember watching any fireworks, even though it was the 4th of July! This entry was posted in Anniversary, Camp meeting, Dad, Glen Williamson, Indiana, Jerry, Me, Memories, Michigan, Reminiscing and tagged Camp meeting, Dad, Family, Free Methodist Church, Glen Williamson, Jerrry, Me, Memories, Michigan. Bookmark the permalink. Could be you don’t remember watching any fireworks because there were special “sparks” flying between you and Jerry! Thanks, Marian! 56 years, just doesn’t seem possible! Time flies!